Cowen argues that we are getting "better at measuring". How has he determined this? How could we even hypothetically verify or falsify this claim? It's inescapably question-begging, because it supposes that we already have an objective measure of productivity -- that's what we necessarily appeal to if we want to insist that our accuracy in measurement, by some standard, is increasing. This is all just a way of declaring, without argument, that capitalism's measure of productivity is justified. His example about journalism is instructive since it's so at odds with public opinion. Cowen claims that web metrics, by measuring "how many people are reading which articles for how long, and also whether they click through to other links...allow us to measure value fairly precisely." But there's a reason why "click-bait" is a universally recognized pejorative: most people reject that measure of value! An extremely common and entirely defensible line of criticism maintains that the editorial fixation on web metrics has actually degraded journalistic productivity, forcing writers to rely on SEO techniques and marketing gimmicks at the expense of valuable journalism. Cowen presumably would try to salvage his position by appealing to some kind of counterintuitive theory of value -- but this places him in a hilarious double bind. Now he can rely on neither evidence nor logic. Evidence seems to suggest that the way we measure value is incorrect, as demonstrated by his own example of digital journalism. And logic, of course, gives us no way to measure the accuracy of his measurement: he can only make utterly empty and definitional claims, like "The exactness...allow[s] us to measure value fairly precisely." How can anyone call this science? Insofar as economics is an actual science that expresses the elegant logic of the natural world, Sumner's premise here is probably correct: we should expect economic theories to maintain a certain symmetry! In fact, that's one of many good reasons for us to be skeptical of capitalism - because contrary to what Sumner seems to think, capitalist theory isn't symmetrical at all. Consider the basic institution of property. It is from the supposedly empirical, value-neutral features of property that capitalism derives its moral authority; its characteristics are non-negotiable facts of the universe that can only be accommodated, and capitalism gains its legitimacy as the best system for doing so. For this reason, we would expect our theory of property to exhibit the same kind of symmetry that we find throughout nature. But this is hardly the case! Just look at how property is bounded in geometric space. Horizontally, the rule is simple and somewhat intuitive: property is defined as every point within a simple, clearly delineated polygon. But how does this rule extend into the third dimension? Sometimes we go by some variation on the old ad coelum doctrine, which stipulates that property rights extend in an infinite ray extending perpendicularly from both sides of the property's two-dimensional plane. In recent years we've made all kinds of pragmatic modifications to this rule: for instance, my property rights only extend to a certain height above my house, which is why pilots don't have to ask for my permission every time they fly overhead. Regardless, it seems clear that an entirely different regime of rules holds for the way that we vertically delineate property rights. This is like discovering that electromagnetism operates by one set of rules moving east and an entirely different set of rules moving south. Generally you would expect property to be defined by a single rule that extends symmetrically into every direction, but capitalism relies on a theory about the universe that's a lot more arbitrary and complicated. Pope Francis's visit to the US - and the reminder of the Catholic church's position on contraception - has revived another round of hand-wringing from liberals about poor people and their occasional fondness for babies. The standard position is that we should expand contraception access for the poor. Liberals generally argue for this by insisting that poor people should be free to choose to not have children, a point that seems fair enough, though since free contraception is already widely available and since 89% of the poor are already using it, one wonders why liberals would consider this a significant problem in the US. @MattBruenig @hyperplanes @crampell would helping those who wish to delay childbirth reduce poverty? Assuming that it isn't offset by any related increases in poverty elsewhere (a non-trivial assumption), contraception can at least give you a one-time shot of poverty reduction. For a moment, this might seem superior to many of the alternatives. But move forward in time and it quickly becomes obvious that the short-term reduction is beat by just about any policy that continually shrinks poverty over time. This may be a simplistic model, but that's just because it demonstrates the failure of a simplistic argument. Ozimek can try to salvage his argument with additional assumptions - but he can only do so by defending those assumptions and abandoning his "any subtraction is good" rhetoric. So for example, he could argue that hereditary poverty is the lynchpin of all poverty and that once you get rid of it simply goes away, though that (not uncommon libertarian) position would then have to deal with the standard scientific rebuttal LOL. 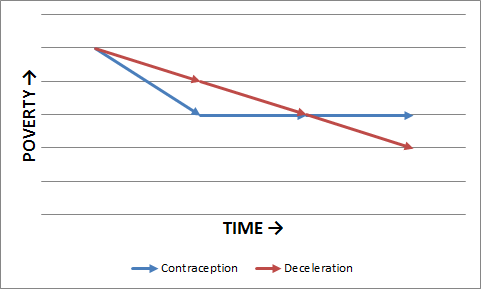 There may be good reasons to support contraception funding, but poverty reduction is not one of them. Any solution that aspires to even the most minimal decelerative effect on poverty is potentially superior - and that's the sort of solution you get by looking for root causes. That sort of focus, of course, will always make liberals, libertarians, and other flavors of capitalist uncomfortable, for obvious reasons. There usually isn't much to say about Republican debates; everyone is not only wrong, but wrong for terribly obvious reasons that anyone with a conscience should be able to pick up on. Still, it's a remarkable spectacle to watch elite professional politicians repeatedly fail to take down Donald Trump. His opponents get that his personal finances surely reflect poorly on him somehow, but whenever it comes up in debates their criticism derails in the exact same way. Last night, for example, Carly Fiorina made the seemingly damning point that Trump was forced into bankruptcy when his Atlantic City casinos "ran up mountains of debt." But then Trump just made the same move he always does: he parried the attack by explaining how clever he was to escape Atlantic City before the city's economy collapsed, and how clever he was to use US bankruptcy laws to his advantage. Again, the reason that this is insane is obvious. Trump is not supposed to prove that he can be an exemplary capitalist destroying everything around him; he's supposed to prove that the country would prosper under his governance. But you can't push too hard on this line of criticism without implying that there is in fact something terribly evil and dangerous about an ideology that glorifies destroying everyone else if you can make a buck. Or without implying that perhaps we should be electing people to protect us from capitalism and its sociopathic billionaires. Republicans can't go after Trump without going after capitalism. And until they do this, they'll continue to lose. Broadly, the ascendance of Trump seems to express some alarmingly fascist psychological tendencies, as noted previously. But this isn't an exclusive explanation for his popularity, and browsing through #tcot Twitter lately I've noticed another dynamic that seems fairly compelling. The #tcot debate over Trump seems to have consolidated into two factions. One sees him as belligerent, bombastic, and vulgar - and therefore unelectable. The other, meanwhile, sees him as belligerent, bombastic and vulgar - and therefore, paradoxically, the GOP's only hope. The latter group offers all kinds of rationalizations for this, but the common denominator has little to do with Trump at all. The common denominator is that all of Trump #tcot's backers are exceedingly and loudly impressed by the savvy and insight they've demonstrated with their pick. Trump's opponents Just Don't Get It; they're stuck playing simplistic, earnest politics-as-usual while he mops the floor with them. They continue to offer all kinds of procedural and normative critiques of Trump's past, his campaign style, and his relationship to the GOP, but the Trump campaign can't be bothered to rebut these critiques - it simply transcends them. Trump understands that the ends justify the means and that in the end all that matters in politics is winning. His supporters get this too, which is why they deride complaints about how rude and cynical Trump is as hopelessly naive. It seems clear to me that while a lot of people are attracted to Trump as a form of catharsis, there's a significant horde of #tcot wise guys who think they've cracked the code of electoral politics and are extremely proud of the bit of knowledge they've discovered. They enjoy the opportunity to make a show of this and to put in their place misguided dummies who still play by the old rules. They inevitably couch their debates in terms of the naivete of their opponents and the brilliant ruthlessness of their own realpolitik. This element, of course, is present in every campaign and every election; the guys voting for Trump this year were voting for Ron Paul last time because they saw through the lies of the Establishment; if they were Democrats, they would be the sort of Democrats who insist that every mistake Obama makes is actually a brilliant move in a complex game of 11-dimensional chess. In the case of Trump, they simply seem dumber than usual, and unusually proud of it. Taxes are what you pay to live in America—to have democracy, opportunity, government services, and the vast infrastructure build by previous taxpayers—the highways, the internet, the schools, scientific research, the court system, etc. Taxes are membership fees used to maintain and expand services and the infrastructure. Remarkably, this passage is meant to offer "another way to think about taxes" - but even as he tries to oppose the right, Lakoff grants them a crucial premise. For the American right, taxes are a coercive transaction, and thus often tantamount to theft, since they deprive people of property that they're entitled to. For Lakoff, meanwhile, enjoyment of government services legitimizes the transaction as voluntary. In both cases, however, the citizen has given something of theirs to the government. Even in Lakoff's case, the property initially belonged to the person paying taxes; one cannot ordinarily pay "membership fees" with someone else's money. These frames may be popular and intuitive, but they're at direct odds with a standard moral justification for taxation: "where possessions have have been acquired through unjust processes, purposive takings may be required to restore rightful possession." By this conception - I'll call it restorative taxation - taxes are not in any meaningful sense "what you pay" to the government, because the wealth was never yours to begin with. You may have temporarily acquired it in some way, but you did not earn it, and are not entitled to keep it. the victim would have no recourse except to seize the offender’s property as compensation. But here again, the use of force cannot be left to the decision of private individuals. And this leads to one of the most important and most complex functions of the government: to the function of an arbiter who settles disputes among men according to objective laws. There are a lot of wealthy, successful Americans who agree with me—because they want to give something back. They know they didn't—look, if you've been successful, you didn't get there on your own... If you've got a business—you didn't build that. Somebody else made that happen. Obama's argument for redistribution is compelling on its own terms, but it still concedes too much when it argues that the wealthy should "give something back." Put properly, the wealthy aren't "giving" anything back - those funds always belonged to society, and society is merely reasserting control of them. This is critically different from the liberal formulation, which maintains that the rich have property rights, but asks that they be waived for one reason or another. In fact, ultimately, restorative taxation asks nothing of the wealthy at all, except that they refrain from asserting private property claims over holdings that are not rightfully theirs. This is a pretty trivial expectation, and one that most Americans would accept as legitimate and just. We can quibble over how much property the rich deserve in the first place, but there is no reason to simply assume that the distribution is already perfect, or to reject restorative taxation as an in principle violation of property rights. In the latest of a growing genre - Why Aren't More Black Voters Feeling the Bern? - Terrel Jermaine Starr gives us nearly 4,000 words that, once again, fails to actually investigate what black voters think about Bernie Sanders. This has gone from embarrassing to surreal. The volume of pieces that "explore" / "voice" / "report on" what black Americans think about Bernie Sanders can now be measured in tons, and yet as far as I can tell we haven't even seen a single attempt to actually determine this in any meaningful way. It's not an impossible or even particularly difficult task. We have an extremely simple and rigorous way to answer this sort of question: it's called "polling". You can ask a lot of black voters what they think about Bernie Sanders and why they think what they do, and then you can tabulate their answers and get a very clear and objective picture of the national trends. You can present all of this exhaustively in a table or chart. There is no need to speculate or ask "experts" what they think about this. You can just find out. Jamil Smith suggestively refers to Starr's article as the "report his editors almost quashed." Why didn't they? To his credit, Starr puts in a lot more work than most of his peers on the topic (including Smith), interviewing more than a dozen sources and even throwing in some tangentially related polling. This is infinitely better than the eight paragraphs of armchair analysis and Twitter quotes that have become the industry standard - but it still fails to answer its own question, also per industry standard. Everyone knows that Sanders has significantly less support among black voters than Clinton. Everyone knows that his favorables among black Americans remain low. Everyone knows that media personalities, political operatives and sundry academics have all kinds of differing and often competing explanations about why this is. None of this answers the question. There are obvious reasons why expert perspectives and pure conjecture may not be the best sources of knowledge about what black Americans think. There are also, to be blunt, obvious reasons why you might rely on experts and conjecture anyway - and none of these reasons are flattering. So do yourself a favor, do your readers a favor, and do black Americans a favor the next time you want to know what they think about Bernie Sanders. Ask them. I can't tell whether this is just a frivolous hot take (as Elizabeth Bruenig suggests) or if these people are in earnest, but this is not in any case a particularly compelling argument. Its conclusion, after all, is that there are cases in which it is acceptable to kill. Equal consideration demands that we offer predators this defense as well, and that we specifically consider whether a predator killing its prey qualifies as "unnecessary suffering and death". Clearly zebras and the MacAskills both have reasons to consider predation unnecessary. But does Cecil the lion? From here, you can take the argument in two directions. On one hand, you can argue that the imperative of basic survival is always an absolute justification for killing. This is an ambitious position, but it appeals to moral intuitions that the MacAskills can't simply ignore - as they do when they compare predation to the scenario of "an infant with a handgun". That hypothetical acknowledges the actor's lack of moral agency, but it completely ignores the predator's interest in killing - one that the infant simply does not have. From behind the veil of ignorance, it seems defensible to insist on the right to do whatever it takes to survive. You would only reject this if you knew beforehand that you were prey - precisely the sort of incidental consideration the veil of ignorance tries to disregard. This logic also gives us reason to reject their justification for non-judgmental intervention. We allow predators to survive not just because we think that they're innocent, but also because we would want them to let us survive if we were in their position. If we accept an absolute justification for survival-killing from behind the veil of ignorance, it follows trivially that we have to extend this courtesy to others. Instead of insisting on an absolute license for survival-killing, we can, on the other hand, simply insist on a conditional license. This right is grounded in the same utilitarian logic that the MacAskills rely on in their justification for killing lions: survival-killing should be permissible if the suffering and death it prevents outweighs the suffering and death it causes. So the right to kill becomes a kind of large-scale optimization problem. Since the authors suggest that this could be undertaken through "a rigorous risk analysis," it's worth insisting that the sort of analysis and control this would require is almost certainly mathematically impossible. Have these people not seen Jurassic Park? When they admit that "ecosystems are complex things," do they get that this is, mathematically, an admission that they are extraordinarily unpredictable and unknowable? Insofar as this argument depends on any degree of certainty about what will and will not happen if we wipe out a particular species, it is hilariously implausible right out of the gate, and certainly demands some minimal exposition before we accept it as a justification for killing. The authors try to finesse this problem by insisting that they are only considering "the killing of individual predators," which is "unlikely to have knock-on effects on the ecosystem of the region." But this sets the bar for their argument far too low. They need to do more than rule out "major impacts" on an ecosystem; the utilitarian argument requires a counterfactual demonstration that the lives and suffering spared will outweigh the predator's survival. This generally cannot be done. Consider, for example, the simple possibility that your target dies before it has the opportunity to kill again. This can obviously happen, particularly with omnivores and scavengers, with animals that go extended periods of time without eating, with animals the have short lifespans or that live near the bottom of the food chain, and so on. In that case, you will have done nothing to relieve anyone from suffering or death, though you will have certainly robbed that animal of the precious time it would have otherwise had. Or consider the possibility that this animal would have done exactly what you are trying to do: it would have saved some animals by killing others. This obviously happens in cases of predator-on-predator predation, territorial struggles, herd hierarchy struggles, and so on, when a voracious predator is killed by one that is slightly less voracious. This, again, need not entail some kind of major impact on the ecosystem - it need only lead to more death and suffering than you tried to prevent by killing in the first place. So even a conditional license to kill predators based on utilitarian considerations seems ultimately to demand a far greater degree of certainty than is generally possible, even on a case-by-case basis. There is simply no reason to assume that the first order effect of killing a predator will necessarily be justified by the impossible complex and unknowable cascade of second and third order effects that would follow. And even if we think it probable, it seems unlikely that we could establish it with the moral certainty that an affirmative justification for killing requires. All of this seems fairly obvious to me. It may be a fun "thought experiment" to imagine who (and what) we would be justified in killing given certain knowledge of the future, but that kind of hubris is the province of Raskolnikov and Rumsfeld. Most ecosystems are far too complex to facilitate even case-by-case justifications for killing, much less the large-scale intervention that the MacAskills - even as they distance themselves from it - seem to think is possible. Leftist feuds over participation in electoral politics may vary in the particular rationalizations at stake, but the political psychology at work seems to be fairly consistent. Crucially, the opponent of participation holds the default political position of passive inaction. This usually ends up having two symmetrical effects. On one hand, it allows him to adopt a posture of cyncism, even if he is making an affirmative, controversial argument; since he can always declare himself unconvinced by criticism, it can seem as if his argument has held, even though it hasn't. On the other hand, it forces the advocate of participation into a defensive posture, even when she is making modest arguments or declining to accept affirmative ones. Anything she says can be doubted, and her failure to persuade can seem to vindicate those doubts. Simple example: consider the idea that the election of Democratic and Republican candidates will always have effectively identical consequences for society. Basic skepticism demands that we understand this as a claim to be argued for, not a Truth to be accepted. To the extent it's obvious it should be easy to prove; but even in that case, it certainly isn't unquestionable, nor is it somehow self-proving or definitionally true. As a matter of basic probability, it turns out, the exceedingly particular prospect of absolutely identical outcomes is far less likely than the general prediction that, given an effectively infinite range of possible outcomes, the consequences of two different administrations will probably differ. If only by accident - though more likely, because of predictably different governing practices - one candidate will probably be at least slightly preferential. It would actually be quite difficult to design two policy agendas that are distinct in any way that create, on a national / international level and for all of the foreseeable future, all of the same consequences! In fact, to believe otherwise, it would seem, demands an incredible degree of credulity. We have to believe that our political system is so finely calibrated that not even the smallest aberration in electoral outcomes is possible. It is unclear why anyone would actually think this; it isn't a tenet or implication of any political philosophy in the known universe. Even if you believe that our system maintains a certain status quo by modulating the two parties, there is no need to suppose that it does so perfectly, or that this status quo cannot encompass a range of preferential outcomes. Faith in such an exact equivalence between parties reminds me of nothing so much as the right's fanatical faith in absolute market equillibrium. These are both extreme and extremely untenable views, for many of the same reasons. Nevertheless, it's clear that in our political discourse, the person arguing for a difference between parties is understood to occupy the credulous and dogmatic position, while the person arguing for a functional equivalence is somehow the agnostic skeptic. This owes less to the actual merits of their positions than to their respective agendas - one advocating action and judgment, the other advocating passive abstinence. In general, when you examine the leftist case against voting, you find a lot of arguments that on their own are extremely weak and untenable. But by default, they are likely to survive. The always excellent Mark Ames just posted a brief article pointing out an embarrassing complication for the right: the 14th Amendment they oppose because of its guarantee of birthright citizenship is the same 14th Amendment typically invoked in legal defenses of corporate personhood. This is a pretty solid logical critique of right-wing jurisprudence. Even more damning, it exposes the sick cognitive dissonance the right has to lean on when it wants to empower corporations while attacking real people. But as always, it's worth clarifying that jurisprudence is garbage and no real basis for corporate power. Ames touches on this when he notes corporate personhood's ridiculous chain of precedent, leading back to Chief Justice Waite's infamous "obviously corporations are people" headnote. That alone should make it perfectly obvious that corporate power is about our oligarchic overlords finding pretexts to do whatever they want, no matter how flimsy. It's not as if we're just dealing with unfortunate aberrations from the rationality of sound jurisprudence, errors that we could patch, and by patching them end the scourge of corporate power. In fact, there's plenty of reasons to suspect that both Waite's headnote and the 14th Amendment are entirely incidental to the persistence of corporate power, and that it would certainly find expression elsewhere if not in those particular clauses. As early as 1799, for example - nearly a century before the Waite ruling - we can already detect odd language games in SCOTUS opinions setting the stage for corporate personhood. There, in the court's first ruling of significance bearing upon incorporation - Turner v. Bank of North America - Chief Justice Ellsworth makes an unusual conceptual shift. First he refers to the corporation named "Biddle & Co." in the collective plural, wondering if "the promisees...are citizens...or aliens"; here, the real, individual humans constituting the corporation are clearly in view. But then, without explanation, he concludes that "the promissee" was not averred to be either "a citizen or an alien". Now the real people are no longer in view, and Biddle & Co. is to be understood as a single entity - not a person, perhaps, but something other than a plural collection of real people. The early history of SCOTUS jurisprudence is full of moves like this, always refining the corporation into a more human-like entity, and always, it should be noted, to the corporation's advantage. The very word "corporation" is etymologically related to the body, but by 1804 that metaphor has become explicit. By 1809 the corporation is said to have "corporeal qualities"; by 1839 a corporation can be contemplated independently of "the act to which it owes its existence," has a location in geometric space ("Corporations are localised and stationary"), and "are considered by the legislature as citizens"; that same year it is said to have "residence, habitancy and individuality", as well as "ligaments," a skeletal "frame," and a "heart"; and by 1873 corporations are at least "artificial persons". So by the time Santa Clara came around it was almost superfluous to call corporations "persons" within the meaning of the 14th Amendment. They had already won most of the conceptual advantages of personhood in previous cases, and it seems clear that they would have continued to game the law to win whatever other power and privileges they wanted, with or without Waite's headnote. Jurisprudence doesn't create corporate power - corporate power creates jurisprudence. And jurisprudence, I repeat, is garbage.